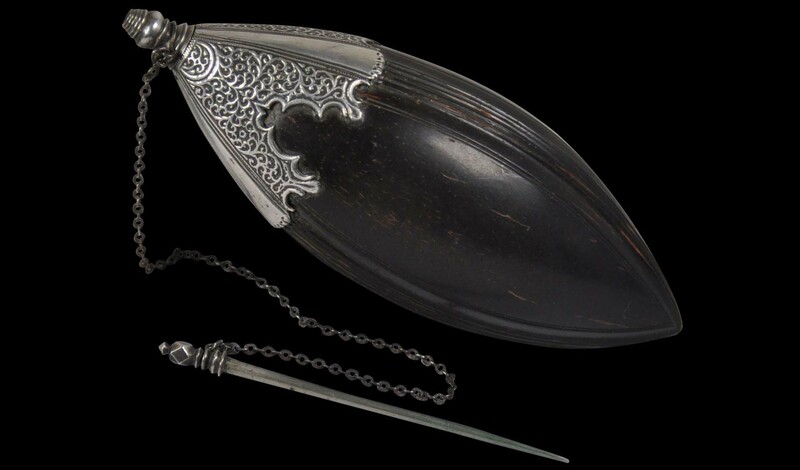 This very elegant container was used to hold kohl which wealthy Berber & local Jewish ladies would use to darken around their eyes. It comprises a long nut (a small species of coconut) carved with three bands of fine ribbing, and silver mounts chased with interlaced Arabesque scrollwork. The end of the nut has a fine silver stopper and applicator which is attached to a silver chain which links to the neck of the container. The stopper is exquisitely turned. The item is in excellent condition. Splendeurs du Maroc, Musee Royal de l’Afrique Central, Belgium, 1998.